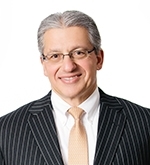 Frank A. D’Amelio has served as a member of our board since July 2012 and as Executive Vice President, Business Operations, and Chief Financial Officer of Pfizer since December 2010. Mr. D’Amelio joined Pfizer in September 2007 and held various positions, including Senior Vice President and Chief Financial Officer. From November 2006 to August 2007, Mr. D’Amelio held the position of Senior Executive Vice President of Integration and Chief Administrative Officer at Alcatel-Lucent, S.A. From March 2006 to November 2006, Mr. D’Amelio was Lucent Technology’s Chief Operating Officer, and from May 2001 until February 2006, he was Lucent’s Executive Vice President, Administration and Chief Financial Officer. Mr. D’Amelio earned his MBA in Finance from St. John’s University and his bachelor’s degree in Accounting from St. Peter’s College. He currently serves as a member of the Board of Directors of Humana, Inc., and as chair of its Audit Committee. He also serves on the board of the Independent College Fund of New Jersey.